I'm the type of person who hates to throw out a perfectly good lamp just because there is a crack in the base but I also know that I can't sell the lamp or give it to someone whose expecting a pristine good. I bought books from a print on demand service to use as promotional materials, but they came misprinted. They are still perfectly readable, so I don't want to just throw them out but I also don't want to send them to people who might think the books are the polished finished version. I decided instead to give them out for free to people who are interested in reading Shift World but prefer to read a physical book and don't mind an imperfection or two. These misprints have wildly variable margins. 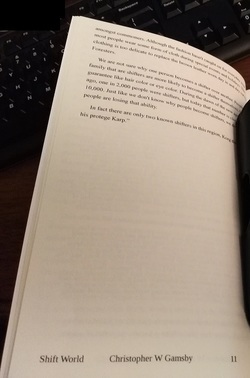 Normally a print on demand book's margins vary by 1/16th of an inch. 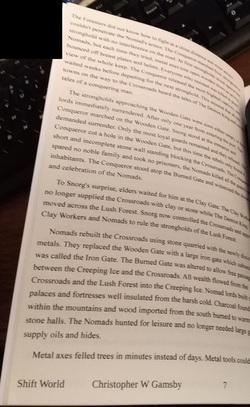 These copies of Shift World vary by as much as 6/16th of an inch, which means that the text on some pages goes right to the edge of the page and other pages have more than a 1/2 inch margin. All of the words on all of the pages remain readable . I've written 'MISPRINTS' on the title page of each book. Thank you so much for your interest in Shift World . As an individual reader you may feel like your voice is unimportant but indie authors live or die by the word of mouth and reviews of perfect strangers. All that I'd ask in exchange for a free copy of the book is that you go to a website like goodreads, Smashwords, or your prefered platform and leave an honest rating or review. Right now I don't have any Misprints to give away. If you found your way to this page, it is only here as a place holder.